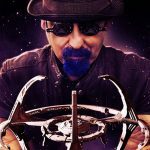 If you were a fan of Discovery‘s approach to classic Star Trek storytelling in “New Eden,” then “An Obol for Charon” is right up your alley. While the Discovery is accosted by an angry space blob, Saru deals with a killer cold, and Tilly, Stamets, and Reno trip on mushrooms in engineering. Let’s break it down. 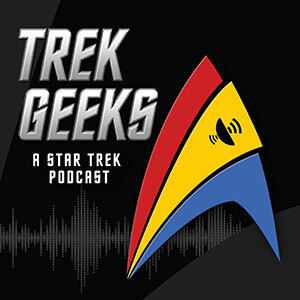 The episode begins with a landmark moment for Star Trek continuity: the introduction of Rebecca Romijn as Number One, famously played in TOS “The Cage” by Majel Barrett. Romijn seems to step into the role well, occupying the space with clear respect for the character but bringing her own modern coolness. 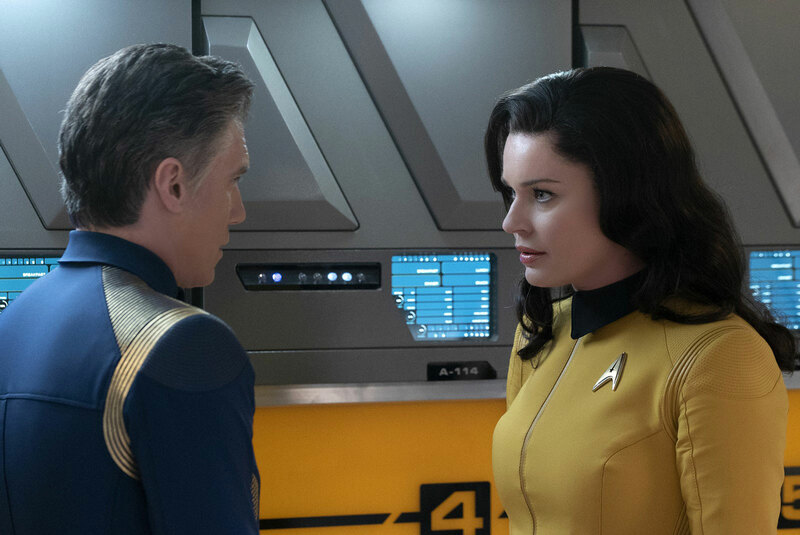 She has no problem expanding what little we know about Number One (including her eating preferences), and her interaction with Captain Pike is already indicative of years of service together. 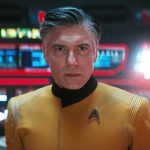 Number One doesn’t get a lot of screen time here, as she exists mainly to update Captain Pike on Spock and how to find him, but we do get a wonderful piece of continuity that explains why the Enterprise doesn’t use holographic projectors like the ones found on Discovery. Let’s hope it isn’t too long before we see more from Romijn’s Number One. 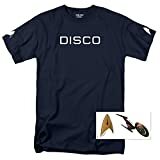 On its way to catch up to Spock, Discovery is jolted out of warp by a seemingly antagonistic space blob, and among the ship’s problems malfunctions is a never-before-seen issue with the Universal Translator. It’s quite amusing suddenly hearing the crew try to communicate when they are all speaking different languages, but luckily everybody’s favorite Kelpien can parse this linguistic difficulty to restore some order. It’s here we start seeing the masterful performance by Doug Jones as Saru in this episode. Acting behind so much prosthetics and makeup requires, shall we say, subtle exaggeration. All your movements must be precise and pronounced to effort any emotion behind the mask, and it’s no secret Doug Jones is the best in the business when it comes to this. In “An Obel for Charon,” we learn more about Saru and his people, and indeed this episode is the second part of a character arc that began with the Short Trek “The Brightest Star.” As he realizes his sickness is much more serious than just a cold, we see a far more emotional and personal side of Saru than we’ve ever seen before. The end of the episode marks a foundational change in who Saru is and what it means to be Kelpien. It’ll be interesting to see how Doug Jones reflects this evolution in his performance in future episodes. 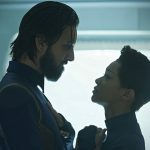 Meanwhile, Paul Stamets must help Tilly face a grotesque situation, as she has a blob of her own to deal with, one that has attached itself to her arm. But like the blob outside the Discovery, this blob is more than meets the eye: it’s a sentient being that lives in the mycelial network, and it tells Stamets that Discovery’s spore drive is hurting its ecosystem. Allegory! This isn’t the first time Star Trek dealt with the consequences of zipping across the stars, as TNG’s “Force of Nature” had Picard and crew face the idea that warp drive was damaging to a species called the Hekarans. In Discovery, the intriguing question is asked: is it worth using the spore drive if it hurts these network dwellers? 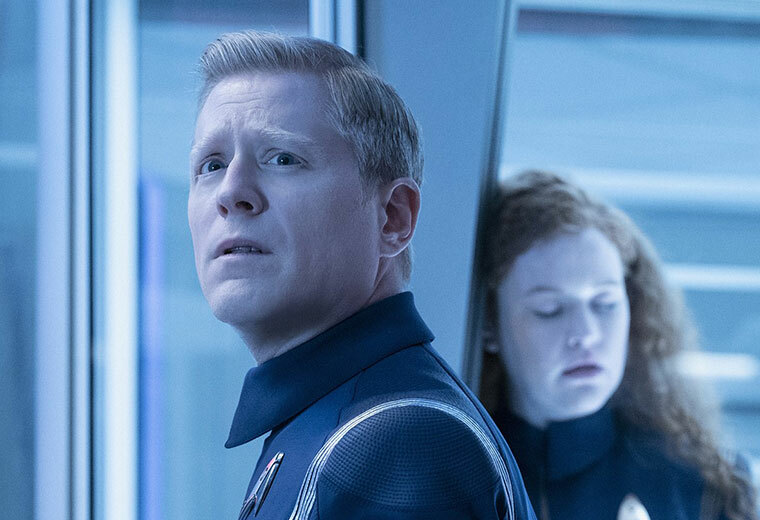 In true Star Trek fashion, Stamets doesn’t think so, and his willingness to stop the spore drive’s use is a great tease as to why the drive is never mentioned again in Star Trek. Throughout his ordeal, Mary Wiseman is quickly expanding beyond her already excellent range as a comedic actress, and she has some serious moments that convey the danger Tilly is in as the mycelial entity controls her. She truly seems to be in a bit of danger at the end of the episode, so her dramatic workout certainly isn’t done yet. And it’s in this episode that we get more time with Tig Notaro’s Reno for the first time since the season premiere. 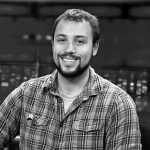 Notaro is quickly becoming a favorite secondary character on Discovery, with expert deadpan delivery that meshes well with dramatic situations. But after being trapped for so long on the asteroid among the wreckage of her ship, does it make sense that Reno is immediately transferred to Discovery, and not given, say, some time off after her ordeal? “An Obol for Charon” is a bottle show through and through, and it’s an excellent one at that. 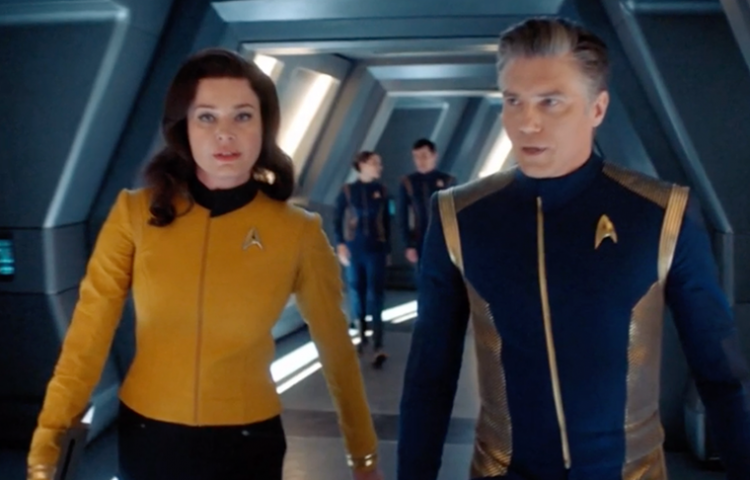 It’s conclusion is perfectly Trek-esque, in that the characters expand their knowledge of life as they know it, while carrying on the legacy of an alien that is more than meets the eye. An intriguing new character arc is set up for Saru as we gear up for his eventual return to his homeworld, and ethical questions are raised as Tilly isn’t done yet with the network fungus that we now know is being damaged by the Discovery’s repeated spore drive use. 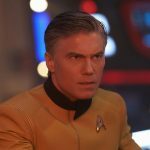 Discovery certainly continues to do right by the Star Trek name. Linus gets a more sizable role here, sitting in on staff briefings and sympathizing with Saru about feeling sick. It would have been kind of cool if he remained a Morn-esque non-speaking role, but as it is, he is a fun side character. 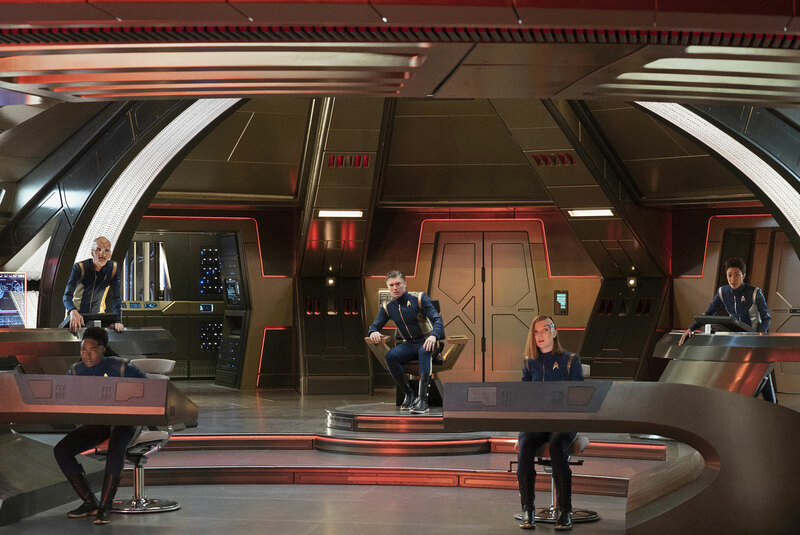 The prolonged goodbye scene with Saru and Burnham seems a little too melodramatic, especially since it wasn’t too long ago the pair were competitive co-workers. 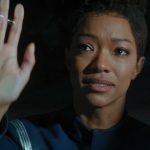 Although it does show Michael’s evolution from her Vulcan roots that she gets so emotional over Saru’s imminent demise. We have Number One and Pike… are we going to see Doctor Boyce at any point? 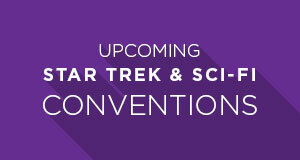 Hopefully we’ll learn more about what the sphere’s data transmission contained, even if it is just references to alien species, locations, and events mentioned elsewhere in the Star Trek universe. The title refers to Charon, the ferryman who transports souls to Hades in Greek mythology. The obel (coin) is what a person would pay him for transport.